The City of Santa Ana is proud to host its second annual Ciclovia – an open streets event where the streets will be closed to cars and opened to bikers, walkers and runners. SOMOS or “Sunday On Main Open Streets” is scheduled for Sunday, November 8, 2015 from 9 am to 2 pm. 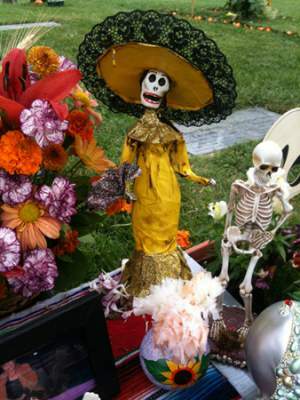 Orange County residents will gather at Fairhaven Memorial Park & Mortuary for its annual Dia de los Muertos celebration, a family-friendly event to honor the lives of those who have passed. A vibrant memorial service, featuring a traditional offertory, music and art, will be held to pray for and remember the lives of friends and family members. 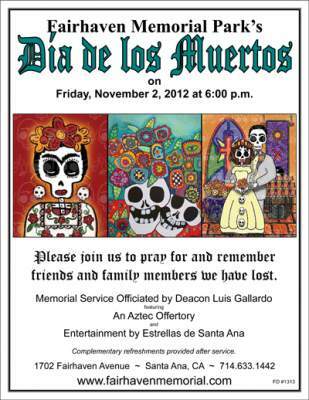 Attendees are encouraged to bring a photo of their loved ones to place at the colorful altars. 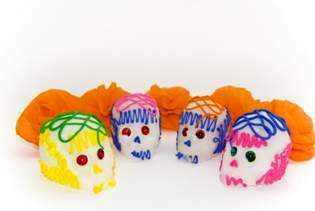 Complimentary pan de muerto and chocolate will be provided by El Indio Tortilleria, Inc.
Day of the Dead (Spanish: Día de Muertos) is a Mexican holiday observed throughout Mexico and around the world in other cultures. The holiday focuses on gatherings of family and friends to pray for and remember friends and family members who have died, according to Wikipedia. 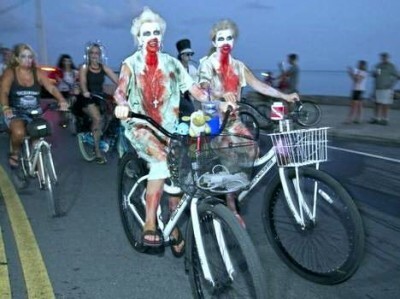 Poll: Are hipsters turning Dia de Los Muertos into another drinking holiday? 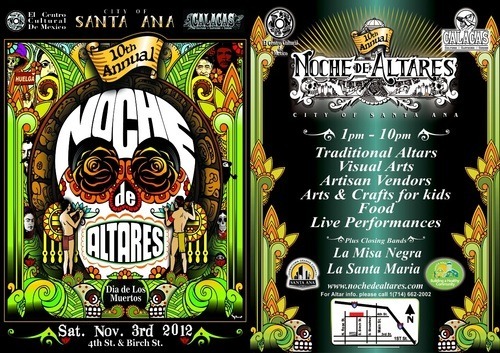 In its 11th year, Noche de Altares (Night of the Altars), was expected to draw tens of thousands over nine hours with its entertainment stages, community-based vendors and more than 100 ofrendas (altars) dedicated to the memory of the deceased, according to the O.C. Register. 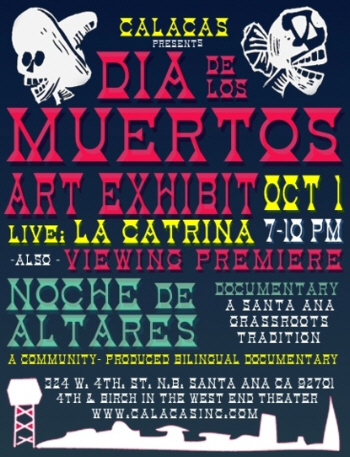 The 11th Annual Noche de Altares (Day of the Dead/Dia de los Muertos) event is set for Saturday, November 2, 2013, from 1 to 10 pm, at 4th and Birch Streets, in Santa Ana. 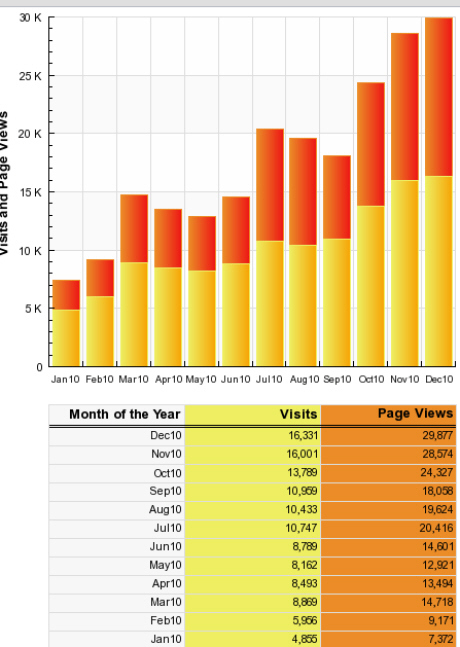 Click here for Facebook updates. Thousands of people gathered downtown Saturday afternoon for an annual Dia de los Muertos/Day of the Dead celebration that has mushroomed in size over the past nine years, according to the O.C. Register. 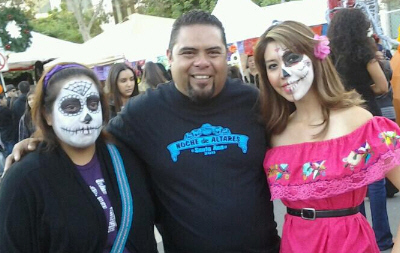 The event was masterminded by Jackie and Rudy Cordova, owners of Calacas and the new Calacas Cafe. This was the Ninth Annual Noche de Altares event. Check out Calacas’ Facebook page for pictures of yesterday’s event. 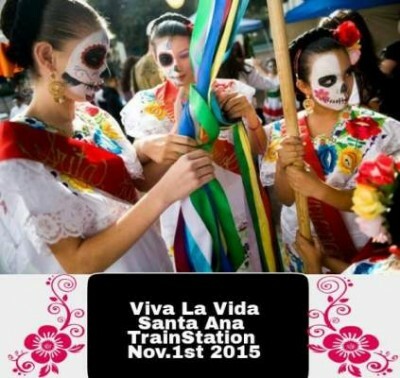 This Saturday’s Santa Ana Art Walk, on Nov. 5, might be the biggest one ever. Not only does it coincide with the 9th Annual Noche de Altares (Dia de Los Muertos/Day of the Dead) event, we are also going to see the Occupy Santa Ana movement conduct a protest at 1:00 in front of the Bank of American on 4th and Main, for Move your Money Out Day. (B of A announced today that they are cancelling their monthly debit card fee increase, so perhaps folks won’t be moving their money out after all). 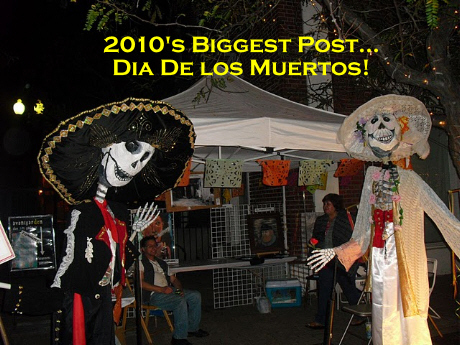 UPDATE: Click here for pictures and a recap of the 2011 Noche de Altares (Day of the Dead/Dia de los Muertos). 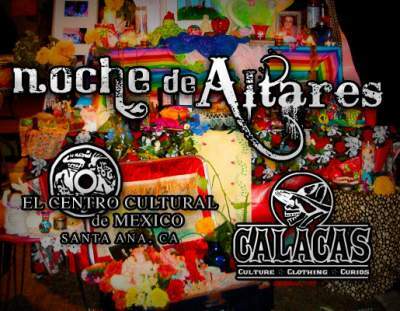 For the 9th year in a row, Centro Cultural de México is organizing Noche de Altares (A Night of Altars/Day of the Dead/Dia de los Muertos) on Saturday, Nov. 5. This year Centro is proud to present this free event in partnership with Calacas Inc., a Santa Ana business that promotes art and culture through products made by indigenous people living in México and local artisans living in Southern California. My wife and my little boy joined me tonight at Santa Ana’s 8th Annual Noche de Altares, commemorating Dia de Los Muertos. The event took place on 4th St., between Ross and Broadway. It coincided with tonight’s Art Walk, which made for a huge crowd and a lot of fun. Families took the time to put together the Altares, or Altars, which are a way to remember their departed loved ones. Each one told a different story. The Altares were amazing. Many of them included photos and portraits, and all sorts of objects which were reminiscent of the departed. There was a huge crowd of people waiting patiently for food, and listening to live music. 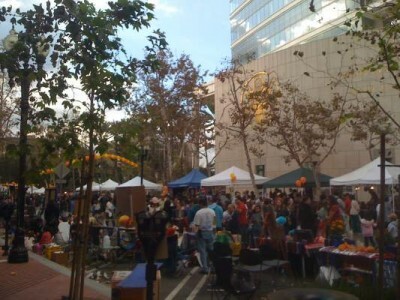 Many vendors displayed their wares all along 4th St. I ran into a lot of friends, including Vicky Baxter of Downtown Inc.; Patrick Yrarrazaval, a Santa Ana Planning Commissioner; Zeke Hernandez, an activist in the local Democratic Party; Daniella Southgate, the Marketing Director at MacArthur Plaza, and many more. We also stopped by the Santora Building, and visited El Sotano, which is Matt Southgate’s gallery. He set up an Altare commemorating Johnny Cash, which we really liked. There was also a haunted gallery at the Santora. Outside, at the Promenade next to the CSUF Grand Central Art Center, another crowd had convened to watch a bunch of Christian break-dancers, which was pretty weird, but they were quite good. If you missed out, be sure to check out the photos in the slideshow atop this post. Kudos to all who were involved in planning this great event, particularly my friends at Calacas! I should note that there was a significant police and security presence, but everyone behaved and we all felt quite safe.